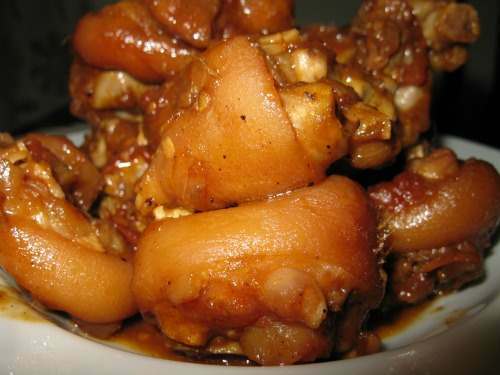 A Filipino Recipe can match your cravings for Pinoy food. 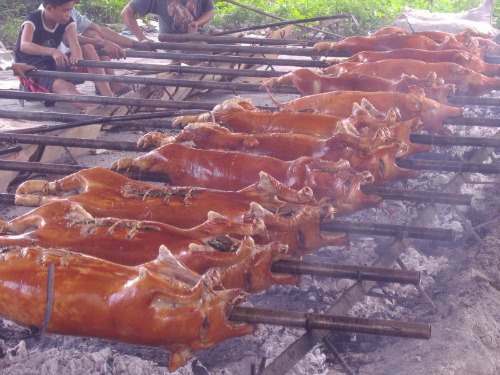 Greats such as lechon, sinigang, adobo and others can fill your eating with great liking. Each recipe can address your simple-to-elegant food measures. Each has an exciting good to offer to you. I’ll share here 6 recipes I deem as classics. This Filipino recipe lets you feel very special once you take it. It lends you topmost gratification as it tastes like no other. To me nothing else in the world can top it. 8 pcs of halved saba bananas. 1. After scalding and removing the innards of the pig, fine shave the skin. 2. Rinse and clear the stomach of any blood. 3. Rub the insides and exterior with salt and pepper. 4. Rub the insides with little soy sauce. 5. Stuff the belly with saba bananas, anise, green onion leaves, crushed garlic and laurel leaves. 6. Place the lemon grass in the center of the stomach, and stitched the belly, ensure no ingredients slip out. 7. 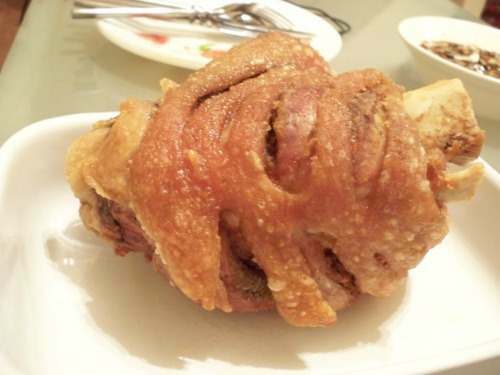 Skewer the pig with a mid-size bamboo and split roast over hot charcoal in a pit. Place the charcoal on the sides of the pit. 8. Glaze the roast from time to time with sprite using a sponge to make the skin crispier. 9. Roast about 3 hours until the meat is tender. This Filipino recipe gives you exceptional delight because it’s cooked longer than its rival, the adobo, to bring out more flavor and savory smell. 1. Slow boil pork with little water in a pot until water dries up and pork exude oil until it browns. 2. Add onions, then garlic, mix, wait onions to soften. 3. Add soy sauce, peppercorn, bay leaves and mix. 4. Add rice water, let boil. 6. Add vinegar, re-boil, simmer 3 minutes. 7. Add salted black beans, simmer 5 minutes. 9. Transfer to serving plate, serve. 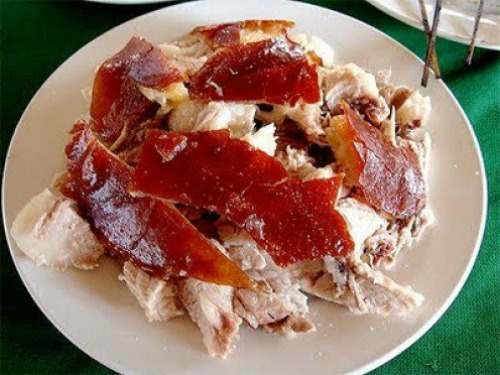 This Filipino recipe gives you soaring delight as it brings out more flavor, savory smell and extra crispy pork rind. 1. Slow boil pig forelegs in a large pan (completely submerged in water) with salt, bay leaves, peppercorn, onion and MSG until meat is tender. 2. Lift, drain and dry. 3. Deep fry until golden brown, serve. This Filipino recipe lends you a healthy, alkaline, more hearty, sumptuous and meal. 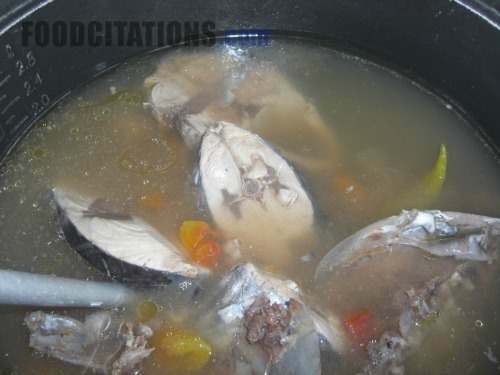 Its lengthy boiling gives you the best bone flavor extract. 1. Slow boil beef spareribs in casserole with salt for 1-1.5 hours or until tender. 2. Add taro, let it tender. 3. Add onion, tomato, green pepper and sinigang mix, simmer 3-5 minutes. 5. Add chicharo beans, simmer 2-3 minutes. 6. Add Chinese pechay, simmer 2-3 minutes. 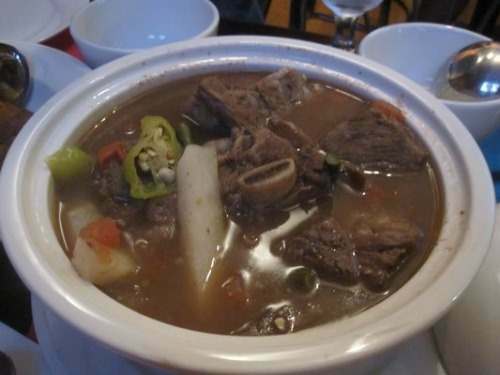 For lunch or dinner, I’ll have real fine moments with hearty beef spareribs sinigang. This very delicious, expensive dish refreshes you if you’re feeling low. 2. Add kangkong, tamarind mix. 3. Add patis and MSG to taste. When I’m served with a simple sinigang yellow fin tuna, I’m always grateful for having such a healthy dish. This dish lends you a non-fatty, healthy, alkaline, more hearty and sumptous meal. 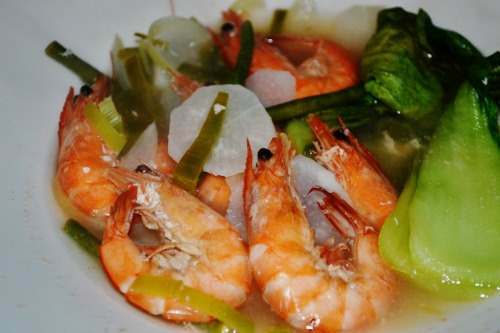 Since my childhood, this irresistible shrimp sinigang has always been my favorite. 1. In a casserole, boil water, add sinigang mix, onions and tomatoes. 2. Lower fire, add shrimps, cabbage, string beans and green peppers, simmer 5 minutes. 3. Season with salt or fish sauce. Done. A Filipino recipe can satisfy your varied cravings and curiosity for Filipino food. There is not just one of it but several. The recipes here are simple. You can follow them seamlessly. They are my personal classics… all sugar-free.